When I started out I of course got some simple soft pads. Those are not good. They don't even come close to the DDR pads in the arcade. 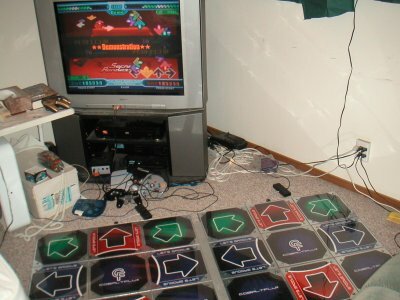 A few months after I got into DDR I bought two MyMyBox pads. They cost me $300 each at the time (I think they're cheaper now) and they were great, but they get worse over time due to their relatively poor construction. I now own two CobaltFlux pads. They also cost $300 each and they are absolutely awesome! They are built extremely solid, so they should last a long time. And the steps feel so good that I'd have to pay $10,000 for an arcade setup to come any closer to the arcade experience. 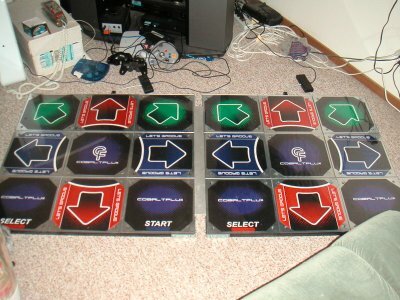 When I started out I just played in the arcade, but when I got my home setup I bought the two US versions of DDR available for the Playstation 2. Of course, after a few months those songs got fairly old, but DDRMAX came out for the PS2 at about that time, so I got that and was happy for a couple more months. But eventually those songs just get old. It also doesn't help that I need to switch between the discs in order to play the different songs and that the interface for the two older ones is absolutely awful. Enter StepMania. It's an absolutely awesome PC version of DDR. You just need to find DWI files at various places on the net (I wish someone would just sell discs full of DWIs. It would save a lot of time.) and you can sort them however you like. However, even though I have a 21" monitor, it still isn't as much fun as playing DDR on my 36" TV. So, of course I just had to update my PC so that I could output video from my PC to my TV. I installed a new video card and hooked up the cables so that they connected to my receiver which in turn piped the video to the other room. At this point the problem was that I needed to connect my pads to a USB hub in one room, but my PC was in the other. (BTW, see the StepMania compatibility page to determine which USB adapters to buy for your pad) So I just bought three USB hubs and three 15' cables (that's the maximum length that usb cables can be) and hooked them together. So now I can plug usb devices into the hub in my bedroom and view output from my PC in my bedroom. Woo hoo! I am now in DDR paradise. My only problem is that it takes a lot of effort to get DWI files. To sum up: I play DDR using StepMania on my PC, but I see it on my 36" TV and am playing with 2 CobaltFlux pads. I have about 500 songs that StepMania recognizes right now, so I'm very very happy. I love DDR! I started playing sometime in 2002 (I think sometime around July) and I've been playing fairly consistently since then. I probably average about 30 minutes a day, 2 days a week. Some weeks I play every day and some weeks I don't play at all, but that's probably a fair average. When I started I was frustrated by the simplest of songs, but within about a month I was good enough to do 5 footers. A month or three after that I could do 6 footers. Maybe half a year later I could do some 7 footers and within the last few months I've found that I'm good enough to do some 8 footers now. My main problem right now is stamina. I can keep up with the steps of Paranoia 270 (that's an 8 footer that's mostly 270bpm) for a couple minutes, but I eventually can't keep going. My theory is that half an hour twice a week isn't enough to actually increase my cardiovascular capabilities enough. So I'm going to try to dance more often and concentrate mostly on the faster songs. I'm not going to let that crummy organ (my heart) be the boss of me!